Join us in “the greatest battle since the world fell over.” In a post-apocalyptic world where bullets have become currency and medicine is even rarer, a clan of marauders use a home brewed drug to turn those who’ve survived into rabid beasts pitting them against each other for their own personal entertainment. Rumor of a girl with supernatural powers reaches their leader who’ll stop at nothing to hunt the girl down to add her to his collection of fighters. “The legend is real…” but Molly fights back. In 2011 an under the radar film with a self-explanatory name, Hobo with a Shotgun brought Grindhouse cinema back for cult genre fans everywhere. In 2015 New Zealand raised the bar with a true Grindhouse budget putting a Turbo Kid on a bike. In 2017 Netherlands did it again and it’s finally made its way to America. 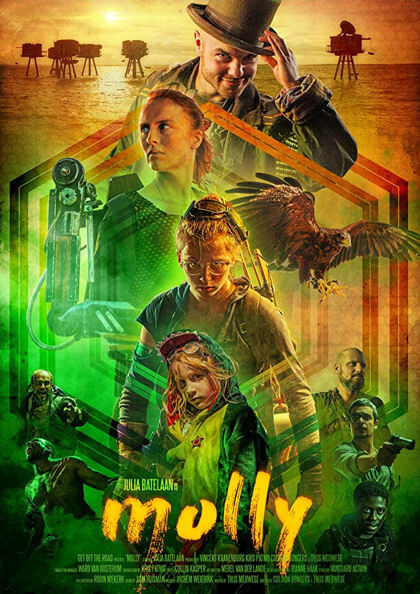 From the prophetic mind of Thijs Meuwese with co-director Colinda Bongers, comes an English language feature in a true tale of Turbo Kid and Hobo with a Shotgun. Molly adds her name to the list of modern day Grindhouse features set in a desolate world with an unlikely hero. Julia Batelaan is tiny and beautiful and badass in her lead role as Molly. Action scenes are Hollywood unrefined and they’re better for it. They’re slower, not as crisp and look more like a real struggle. It’s a big statement to say but Molly has some of the most enjoyable fight sequences I’ve seen since Nada and Frank battled in an alleyway over a pair of sunglasses. Molly’s battle with a rabid while trying to wash herself is a surreal struggle for survival interrupting the most innocent of times. Molly is made off of the vulnerability Julia Batelaan brings to the character and it's held together by the strength she brings to the film. It’s a genre we know through resurgence but isn’t yet overdone. Meuwese works within a budget to bring us a different take in an original form. It’s offbeat authentic in a simple story of a struggle to survive. Molly has arrived from the Netherlands wasteland in a roar of sci-fi action, with supernatural powers. She's just waiting to find her cult audience of Grindhouse features before her.